Cinquefoil Tam | Rosi G.
As soon as I saw this tam in the new Twist Collective, I knew I wanted to make it as a gift for my super-generous boss, Lauren. I decided to go with the yarn used in the pattern because it’s a good quality, a good blend, and hey, the price is right. Although the yarn is a tad splitty, it was nice to work with. The finished hat is super soft. 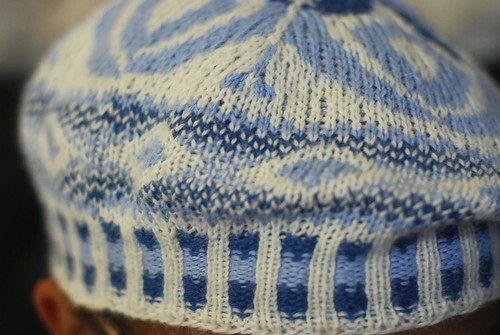 My only concern with this hat is that it came out kind of small before blocking. As far as I know, I got gauge. 😉 I had to stretch it to force it over a plate to block and now it fits my daughter Esmie. 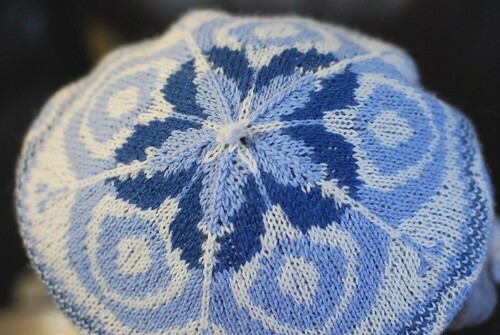 The pattern states adult one size fits most; circumference at brim 18″; diameter across wheel 9.5″ after blocking. When I make adult hats I usually use 20-21″ circumference around brim. Since my boss is not huge like me, I’m sure it will fit her just fine. It fits me like a skully when I put it on. HA! This hat is SO PRETTY! Cute hat! And I swear Esmie looks more like her beautiful mama every time you post a picture! So now you have to make one for Esmie. lol. It’s so cute on her. It’s adorable. I usually go for 20 – 21 inch circumference too. This one seems on the small side, eh? It’s cute on Esme. I want to knit like you when I grow up. Very cute tam! And… Esmie has the loveliest, smoothest skin ever. I was just staring at my face this morning because it’s icky and humid out and I look dreadful, and there she is, glowing. Ah, the joys of being a good… eep, 20 years older. Love the color combo! Lucky boss! That came out so cute. You should give it to your daughter and make another one for you boss. Your little girl looks so good in it. 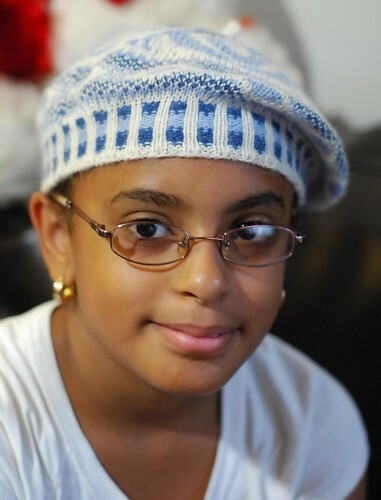 I too love this hat, and love how it looks on your beautiful daughter. Thanks for the heads up on the sizing! Very pretty daughter and hat! Very nice! Plus CONGRATULATIONS on your sweater on KNITTY!!!!!! I love it! 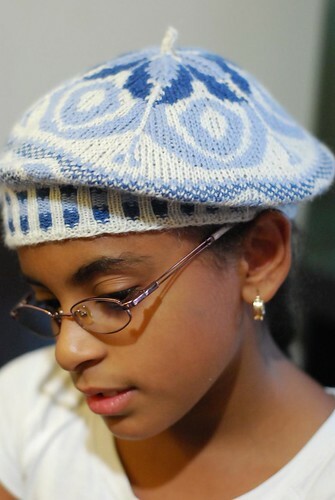 Have it on my list to knit for my daughter. Very, very cool!